In the world of technology there are the early adopters – those who rush to take up new tech and products as soon as they’re available – and then there are those of us who are unkindly labelled ‘laggards’, super-slow to jump on the new tech bandwagon, if we ever jump on at all. But let’s be honest, busy mums with too many things in their heads already mostly spend their time in the ‘laggard’ camp. We simply don’t have time to be reading up on the latest gadgety thing that’s going to transform our lives forever. Who has time for transformation?! We’re already pretty busy trying to ‘transform’ our strong-willed toddler into something a little more civilised. When we do make the big switch, it’s usually because the change has been forced upon us, or it happens by happy accident. It’s not until the last Blockbuster store in a 10 kilometre radius finally shuts up shop, UNTIL busy mums discover the wonder of streaming services. Oh, Netflix! Now that’s very handy … And that iPad we were given for Christmas six years after they came on the market? Turns out that’s a pretty nifty little device too. As a busy mum of three myself, I have made peace with my laggard status. Let the early adopters work out what’s worth spending the money on – and what’s not. So it’s a rare day indeed when I find myself at the cutting edge of handy gadgetry, but that day has come, thanks to being in possession of Google Home, a voice-activated Smart Home device that was released in Australia mere days ago. 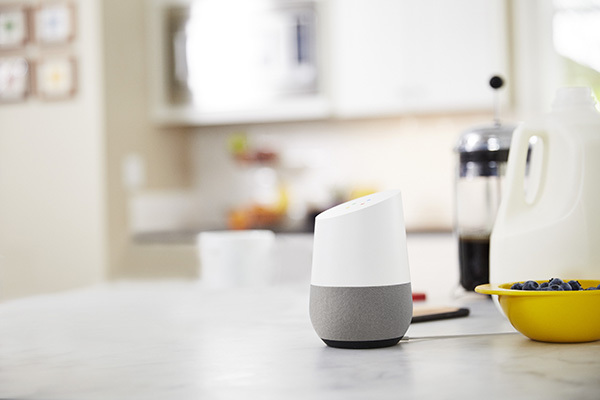 In a nutshell, Google Home is a smart speaker that enables users to make voice commands to interact with Google’s intelligent personal assistant called Google Assistant. Think of a personalised version of Siri interacting with you through a really good quality speaker, and you’ve got the picture. From the very beginning, this seemed to be a device that mums, no matter how busy and tech-challenged, could really get on board with, because it’s actually really, really useful and easy to use. It is a testament to the ease of its set-up that I could take it out of the box and have it functioning exactly the way it was meant to in less than 15 minutes. All it took was plugging it in, downloading an app and then following a couple of really simple instructions. So why should we love Google Home? Have I mentioned that it’s useful? Once set up – and it can have up to six accounts connected to the one device – it becomes a properly personalised experience. It can distinguish your voice and once you utter the magic words, ‘OK Google’, you are ready to go. It can access your calendar, tell you what your day looks like, what your commute to work will be like, the news of the day, the weather and other helpful titbits. You can also tap into the power of Google itself – so all the stuff you quickly google on your phone while throwing food into lunch boxes is now available on command. What’s the name of the Premier of Victoria? How do you calculate the circumference of a circle? How do you spell ‘recommendation’? All answers are delivered in a friendly voice that has been taught to understand Aussie accents and Aussie words. Google Home also links you up with Youtube and Google Play so the family kitchen can become a bit of a disco at a moment’s notice. Everyone can have fun playing DJ and before you know it, you’ll be bopping to such classics as Frozen’s Let It Go. Exciting! And then there’s the radio and podcasts too. All of the listening pleasure. The clever little speaker can also control the TV, lights and speakers around your home – though I have to admit that this is a bridge too far for this techno-challenged mum. But I have been assured that this too is simple to set up if I had the inclination (and the smart house!) to do so. Aside from Google Home’s slightly addictive usefulness that my kids have loved to take advantage of – “OK Google, what’s the capital of Myanmar?” – they’ve discovered that Google Home likes nothing more than to tell a joke or two. All corny, of course. And there’s a trivia quiz game that they’ll happily play round after round of. Oh, the laughs and good times to be had! Google Home retails at $199 and is available at most electronics stores.